At CTM 2014, a special two-day Sound Exchange concert and performance programme at the HAU Hebbel am Ufer (HAU2) brings a selection of projects by younger-generation Eastern European artists working in resonance (or in contrast) with their pioneering counterparts. The Sound Exchange exhibition in the Foyer of HAU2 provides further context by presenting individual artistic positions, regional groupings, and currents in Central and Eastern Europe’s experimental musical cultures from the 1960s to the present. Through various documents, images, and sounds, eight exemplary pioneers and their works are portrayed in regional and historical context, as are their underlying artistic processes and positions. An afternoon programme regrouping lectures, a round-table discussion, and a specially-commissioned film programme focused on the late GDR underground scene that presents rare and never before seen film and video documents, gives the possibility for in-depth reflection and debate. Further examinations of musical developments elsewhere in the East and West will unfold throughout various other events within CTM 2014’s Discourse series. 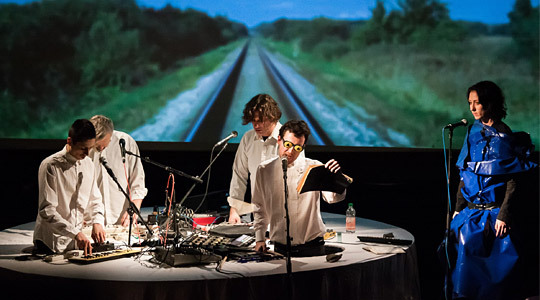 Sound Exchange began its search for the roots and current state of experimental music culture in Central and Eastern Europe in 2010, pursuing commonalities and singularities found within these regions and discussing their relationship with the international history of experimental music. Aiming at rendering local lines of development visible again and encouraging artists to reconnect to these traditions, Sound Exchange produced a series of festivals, exhibitions and workshops in Poland, Slovakia, Estonia, Lithuania, Latvia, Hungary, Germany and the Czech Republic, in close collaboration with local initiatives in each country. CTM 2014 presents some of the findings and achievements of the extensive project through a special condensed programme at the festival, and links it into further dialogue with parallel developments in Russia and the West. This entry was posted on Friday, January 10th, 2014 at 12:33 pm	and is filed under Berlin activities. You can follow any responses to this entry through the RSS 2.0 feed. Both comments and pings are currently closed.